Arrow drawing tool for Adobe Flash CS2, CS3, CS4. 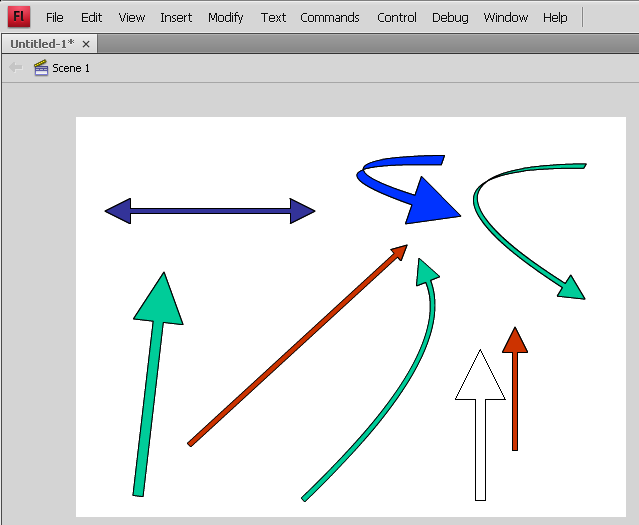 Some Adobe Flash projects require you to draw a lot of arrows. This can get tedious. So, many years ago, I wrote an Arrow drawing tool. It was written for CS2, but still works well enough in CS4. Draws arrows in the authoring environment. Holding shift constrains to vertical, horizontal or 45 degrees. Hold control to set an anchoring point to bend the arrow on. Available options in the Property Window are Arrow Width, Arrow Head Multiplier and Arrow Head Location. Arrow Width is the actual width in pixels of the arrow. Arrow Head Multiplier is how many times larger than the Arrow Width that the arrow's head will be. Arrow width = 5; ArrowHead Multiplier = 3; then the arrowhead will be 15 pixels across. Arrow Head Location options are 'end' and 'start end'; which will give you double or single ended arrows. Add the ArrowLine Tool to the list of available tools. I like it as secondary tool under the standard Line tool. This extension is tested to work with Adobe Flash Professional version up to CS4. It may work on CS5, but will not work in CS6 or Creative Cloud without modifications. Please contact me if you are interested in licensing it for use in Adobe Creative Cloud or in other Adobe products.